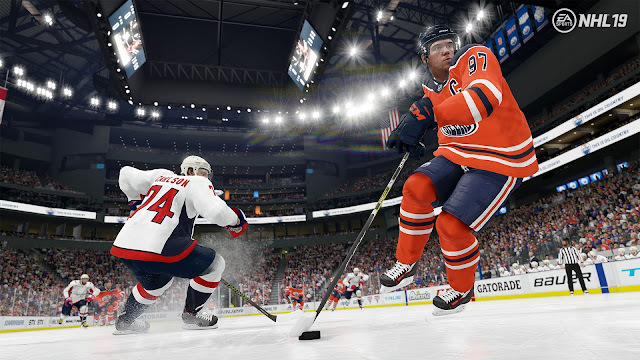 There is no shortage of modes, features and excellent gameplay in NHL 19, but for veterans of the series the decision to buy or not usually boils down to whether or not there is enough 'new' to warrant their hard earned money. Last year that was a murky proposition in my opinion, but NHL 19 brings the goods this year with much improved skating and better contact physics to compliment all of those different ways to play the game. What helps NHL 19 work so well is that it is all about options. It is possible one could say there are almost too many options and that it could be daunting for a new user. After all, one of the very first things that happens when you fire up the game is that it asks you to pick and pin your three most likely to be played modes. Yeah, there are so many modes that the game wants you to try and pick three that will be readily available when you boot into the main menu. The other modes are still available afterwards by scrolling down, and they take up just about an entire screen, so there is no shortage of content to be had. Equally daunting is that NHL 19 asks you to pick from a handful of options right off of the bat as well, from difficulty/ game style, to controls and more. The good news is that none of these options is permanent and they really are meant to be training wheels for newcomers. If you are new to the series, I also strongly recommend the tutorial/ training options, as they do a fantastic job of helping you understand the nuances of the sport. There is a lot that goes on in hockey, both from the actual mechanics of gameplay to the various rules that one needs to understand. All of this is compounded by the fact that the NHL is an exceedingly fast sport and things can happen in the blink of an eye. Thankfully even during the game itself, there are plentiful tools available to new players as passing lanes are illustrated and regions where you should be playing defence are highlighted on the ice. Many of the modes should feel familiar to fans of the series, whether they have taken a couple of years off or not. All of the usual suspects are here, from running your favourite franchise to playing online against others to Hockey Ultimate Team (EA's hybrid fantasy sports/ card collecting game that features microtransactions to buy more packs of player cards) to a career mode and more. One of the new additions however is the 'World of Chel', which is a has you creating a persistent player that spans multiple types of games into this mode. 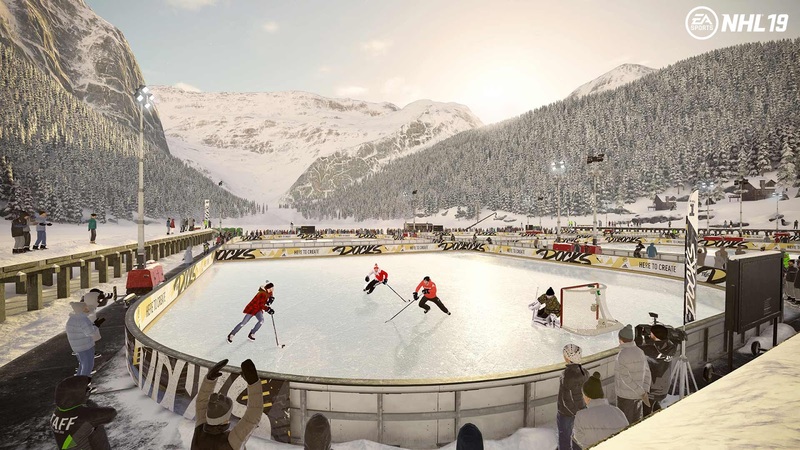 It is played on an outdoors pond in a whistle-free take on backyard football or blacktop basketball - just with hockey instead. Unlockable content serves as a primary progression hook here, but it is a lot of fun. Also returning is the more bombastic Threes, which is an arcade style three against three hockey offering. Still, as is usually the case for me in sports games, the mode that brings me back the most is the career one, in this case called Be A Pro. The setup on this has not changed a great deal this season, starting your player off as a minor leaguer who is a fringe prospect trying to make it into the NHL proper. 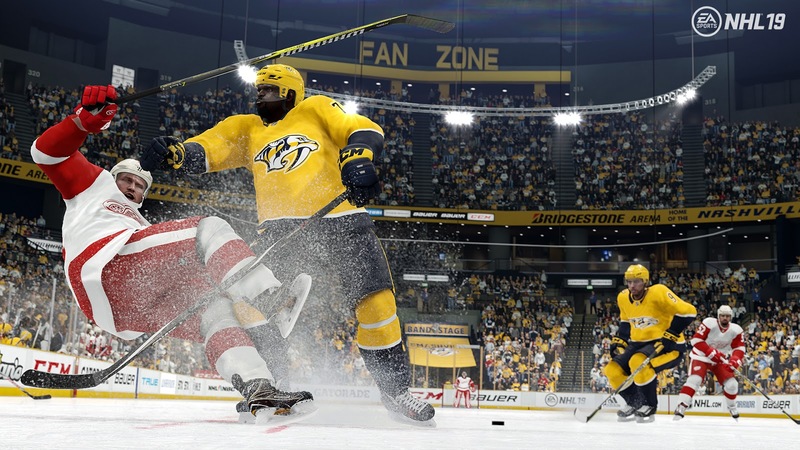 It is a little disappointing to have seen other games like Madden, NBA 2K and FIFA provide some story elements that NHL is still sorely lacking, but the actual progression in Be A Pro is fantastic and probably the best of the different sports. There is in-game 'coaching' here that actually matters (in most sports games it really doesn't though titles like NBA 2K try to use things like a teammate grade to keep players' egos in check), but in NHL the coach's opinions of how you play can impact your time on the ice going forward and there are so many different areas where your skater can earn experience and improve. It might seem as though the path to improving quickly would be to score lots of goals and call it a day, but if you frequently leave your zones on defence, turn over the puck, stay out too long on the ice and miss lineup rotations and pick up stupid penalties, it will effect your time on the ice and your player growth in negative ways. Heck, I picked up a stupid boarding penalty minutes into my first game in this mode, got ejected and saw a negative impact on my team play because my boneheaded decision hurt the team and prevented me for showing what I could do on the ice, putting my ability to get called up in jeopardy right off of the bat. Despite the lack of a good narrative mode, I am happy to see that Franchise mode is still largely the same option with some interesting changes and quality of life improvements. The scouting system in particular has gotten a nice touch-up, with an emphasis on actually scouting for that next gem in the draft. Failure to do so could be the difference between nabbing a potential superstar and someone who is probably never going to make the cut. A few of the other micromanaging aspects have been streamlined a bit to compensate for having to spend more time in scouting. The NHL series has always had a splendid presentation, and this year's iteration continues that trend. Perhaps where it shows up the most is in two areas where the physiques have been reworked - skating and player contact. Movement is far more lifelike than in years past, with especially skilled players (and characters if they have high speed, agility and acceleration) really getting to show their stuff. Hulking defensive players still have a lumbering feel to them, unable to stop on a dime when compared to more agile centres, but that is the way it is supposed to be and the movement feels better than ever. Couple that with the related collision physics, and massive hits and even more subtle jockeying for position looks fantastic. EA's Real Player Motion technology has been in the spotlight for NBA Live and Madden this year, and it shows up again in NHL 19 as well. The technology is not perfect - every now and again it can struggle with trying to manage a bit too much at once creating awkward or even comical results, but these immersion-breaking moments are few and far between when compared to the overall grace with which the game's visuals and physics play out. 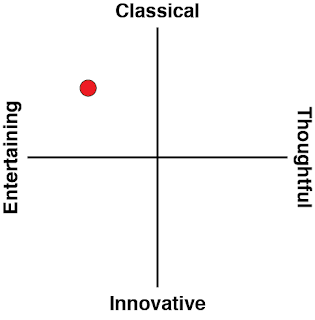 There is more than just a visual aspect to this as well, however. Poke checking has for years been overpowered, and it still has its moments in this year's version of the game, but I feel as though I was picking up more penalties than in years prior - so while it is still effective, it carries a bit more of a risk versus reward aspect to it (though I still see people spamming it online a lot - but I've seen it cost them precious penalties as well). Audio design holds up as well as expected, with EA handling that part of the presentation the same way that it does in all of its sports titles. They find some commentators (and Mike Emrik and Eddie Olczyk are very good here), license a bunch of different songs to play in the virtual jukebox, add some realistic sound effects and mix it all together. 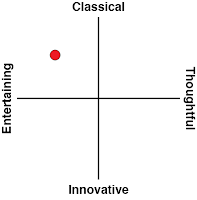 It largely works, even if the commentary suffers some of the problems that all video game commentary seems to (repetition and not always being an accurate representation of what is currently taking place on the ice). In the introduction, I touched on options and that again is a major theme here even in the settings. There are essentially a few different control schemes ranging to an incredibly simplified one meant to provide a more arcade-like experience, to a nuanced one that encourages you to use the analogue sticks for almost everything. In the middle is the appropriately named hybrid one that has both analogue controls and face buttons for those who want to have a middle ground. There are plenty of different settings to be tweaked for the gameplay as well, where you can impact everything from player speeds to hit ferocity to how effectively players can receive the puck on a pass or how likely tempers are to flare and cause fights to break out. 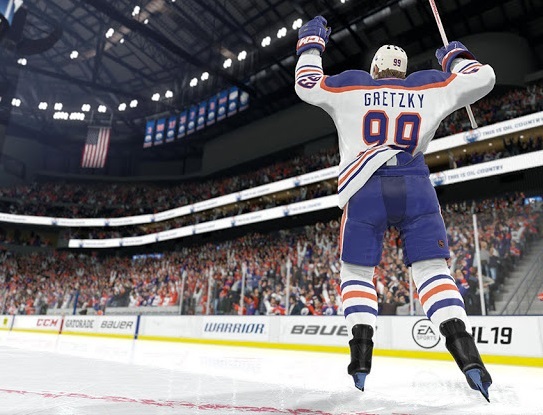 NHL 19 is not a perfect game - but for hockey fans it is pretty darned close. Sure, there are some awkward animations and commentary moments and I would love to see something of a story baked into the experience, but it is astounding to me how this series has grown into a franchise that is as deep and intricate as any veteran player would want, while still somehow being accessible to newcomers as well. Add this to a plethora of modes and an improved physics engine that makes the game more realistic than ever, and NHL 19 is the game hockey fans deserve.